Sieve all the flour and icing sugar together, then add the shortening. Mix well. Add in Baileys and mix well into a smooth dough. Pinch a little and try if the liqueur taste is strong enough. You will love how delicious it tastes! After that, let it rest for about 20 minutes. Meanwhile, throw in sunflower seeds into sesame paste and knead well. Make about 16 sesame paste balls weighing 30g each. Set aside. Dust some Hong Kong Flour on your hand or gloves to prevent dough from sticking. Divide the Baileys dough into half, and roll into 2 long dough. Then make about 16 balls weighing 25g each. This is a tray of assorted flavours we made, pairing with the respective paste. Flatten the dough, and put a ball of sesame paste filling in the middle and wrap around it. Dust more HK Flour onto hand and roll the dough into a ball. 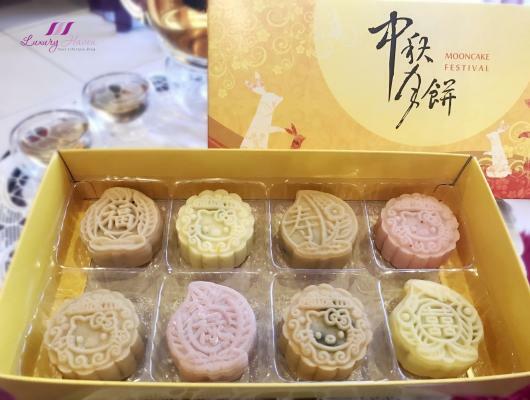 Pour some HK Flour onto a tray and also dust some onto mooncake mould. Shake off excess flour. Put the dough into the mould and press gently. Remove the mooncake from mould and you are done! Refrigerate well and serve your Aromatic Baileys Snowskin Mooncakes with Black Sesame Paste ( 百利甜酒冰皮月饼 ) chilled! Love liqueur desserts? Try your hands at making these Aromatic Baileys Snowskin Mooncakes with Black Sesame Paste & impress your guest this Mid-Autumn Festival!